Have you wondered what chiropractic care can do for your family? Would you like to learn more about chiropractic? How do you find a Chiropractor willing to explain everything in advance? What’s the best way to choose a chiropractor in the Cincinnati-area? Simply ask the readers of the Community Press! Dr. John P. Jones has won the “Community Press Reader’s Choice Award” for Chiropractors in his community this year. This is an annual audit of favorite Doctors in the area, and this is the second year he has been listed in the Top Three. 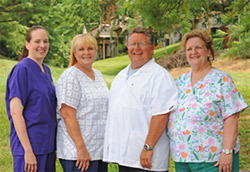 Our staff and Dr. John P. Jones of Delhi Chiropractic Associates welcomes you! Chiropractic is safe, natural and effective. But not all chiropractors are the same! In addition to the traditional approaches to chiropractic, we also offer Massage Therapy and Spinal Decompression in our office. While chiropractic focuses on the relationship between the spine and its impact on the nervous system, Massage Therapy focuses on the 650 muscles of the body. Both disciplines work together to help keep the body in proper alignment, balance and function. DTS Spinal Decompression Therapy is a leading non-surgical alternative to surgery. It is a pain-free solution that has shown a very high rate of successfully reducing or even eliminating back or neck pain. In as few as 12 treatments, you may have relief of chronic debilitating low back or neck pain. Call Delhi Chiropractic Associates today! Can our unique approach to chiropractic help you? With 32 years of experience, we’ve helped many Cincinnati-area residents who went from chiropractor to chiropractor and finally found results in our office. Dr. John P. Jones is excited to hear from you! Call today! Great staff and always on time. Great staff and very happy with my experience! Everyone in the office is wonderful! If I didn’t have 6 kids with me every time it would be a totally relaxing experience! You have a great team. Thanks for all you do!! Dr. Jones and his staff are excellent and I will recommend my friends and family to see him in the future. It the friendliest practice I have ever been too. They are helpful and are always on time! Very good doctor. Very pleasant a friendly. Seems like we already knew him. I was in so much pain not being able to turn my head. Within 2 treatments, my motion had improved considerably. Very Satisfied with results. From answering my first call they were wonderful. Dr. Jones will be highly recommended from me. Staff was very pleasant. Dr. Jones is an experienced physician. He takes his time to understand your level and location of pain, and then uses models to explain what you’re dealing with. He is a professional, personable, compassionate and very skilled professional. Dr. Jones and his staff are wonderful and they truly care about helping me feel better. I am very glad I finally made an appointment to get help with my back pain. I really appreciate the promptness and caring atmosphere from all. Great job, Dr Jones. My shoulder is working again. I love Dr. Jones, Alberta and Robin! They are all great at what they do!